GLITTER has participated at this legendary hunt almost since the begining and this is the 10th year…WOW !! Here is Glitter’s prize. A double mesh dress covered by delicated roses in deep red, which I wish you like it ! Actually on sale at mainstore. GLITTER prize created for the PityParty at the Dolly House HUNT (PPatDDH). Comes in 5 standard mesh sizes, also for Classic Avatars including Alpha Layer. 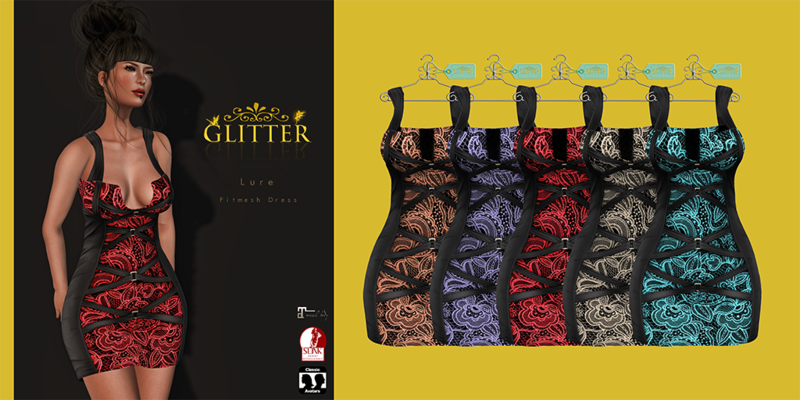 Soon will be found as gift for Glitter members. Pose Fair event 2017 waits for you on April from 15th till 29th. GLITTER Poses presents 5 new exclusives. 3 lovely female set of poses and 2 romantic couple pose. There is a group joiner also in the fair so you can get 10% discount in all sets and poses wearing GLITTER tag! 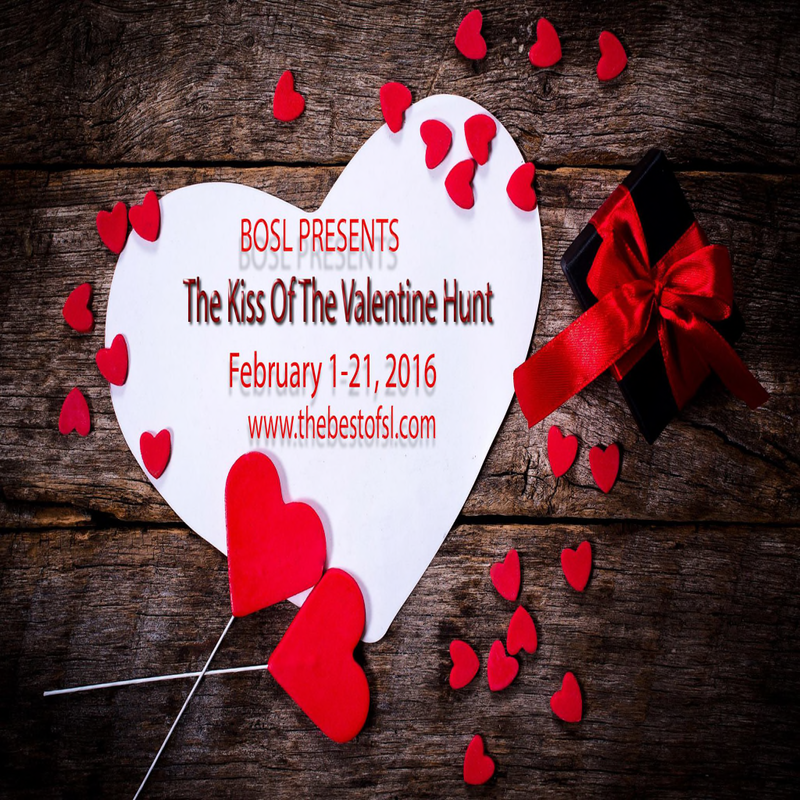 The Best Of SL is delighted to bring you its first of the year hunt, The Kiss Of The Valentine. Let’s celebrate the Best Of SL during the season of Love. This hunt is located on their own sim. A lot of hearts expanded on the park priced 1L$. 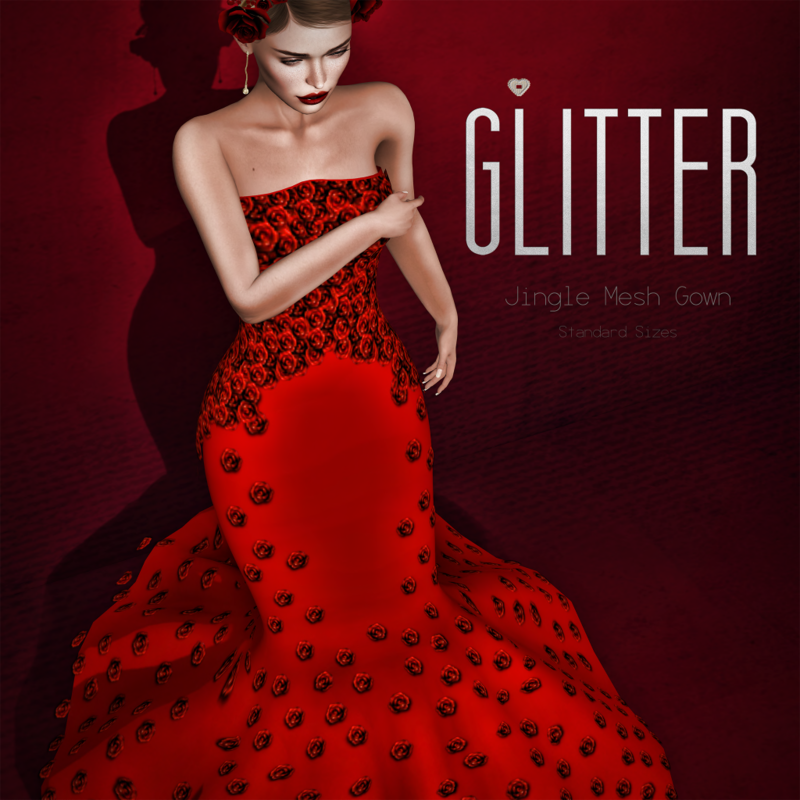 GLITTER has created a system template dress called CUPID in layers for classic avatars in red for this occasion, Appliers hud for Maitreya, Belleza, Omega, eBody and Slink, included a mesh panel skirt. Apply advanced light model to see the materials effect. 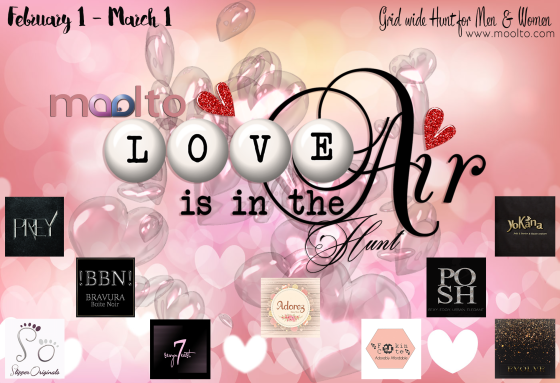 The Moolto “Love is in the Air” runs from February 1st till March 1st. Glitter gifts you this beautiful short dress PEGGY, knitted, half sleeves in an elegant beige color. Available in 5 standard sizes and with alpha layer for classic avatars. Apply advance light model to see materials effect. A LONGGGGG WEEKEND OF SALES !! 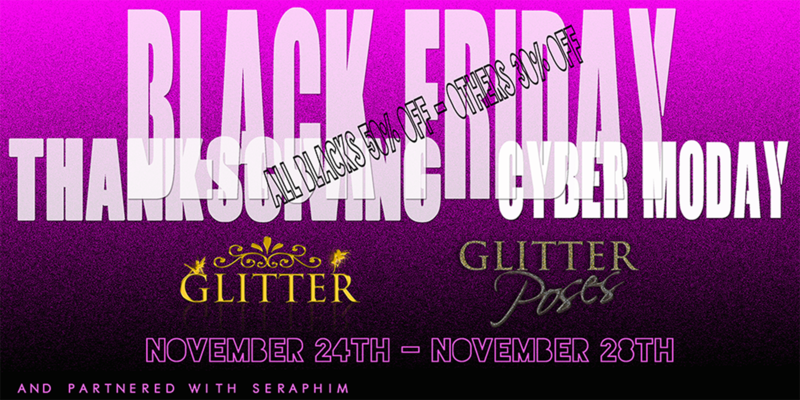 On GLITTER Poses Section the whole store is 50% OFF except the last 2 new releases. Also November 28th is the last day for voting GLITTER Poses as Favorite Pose maker. If you think we deserve it and you have not done yet, please vote. Click on the link below, look for “Fashion Awards Vote Here!” and scroll down the page till the bottom where you will find the category “Favorite Pose Maker” and so, Glitter Poses – Shine Messmer. It will be an honor if you choose to vote for Glitter Poses. Also you can find boards to click in our Plaza if you go to pick up the new November Group Gift and all the past gifts, joining GLITTER! Again….Thank you from the heart! There’s nobody here, except the old circus crew with their Lion Man, the Three-Arm Sisters, the Tallest Man on Earth, and the Bearded Woman.We are living in the 20’s and 30’s. Vintage years, no electrical lights, dusty roads with circus carriages scattered around. An old circus tent stands like a proud “old lady” that knows the end is near…. Socks black & white in layers for classic avatars and with several mesh body Appliers: Maitreya, Belleza, eBody and Omega. There exists a space of shadow and light, the almost imperceptible zone where fashion and fantasy merge. We are .PENUMBRA. We are FASHION! 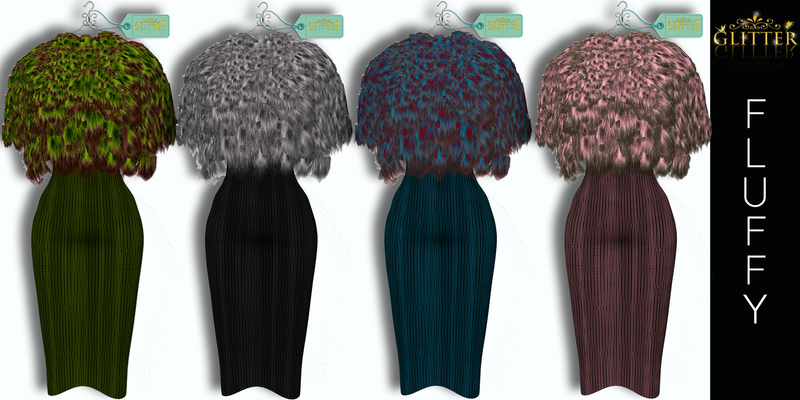 GLITTER has introduced as exclusives for this amazing event FLUFFLY mesh outfit with fur poncho and pencil elegant dress. In 4 autumnal tones smelling nature, wood and forest. 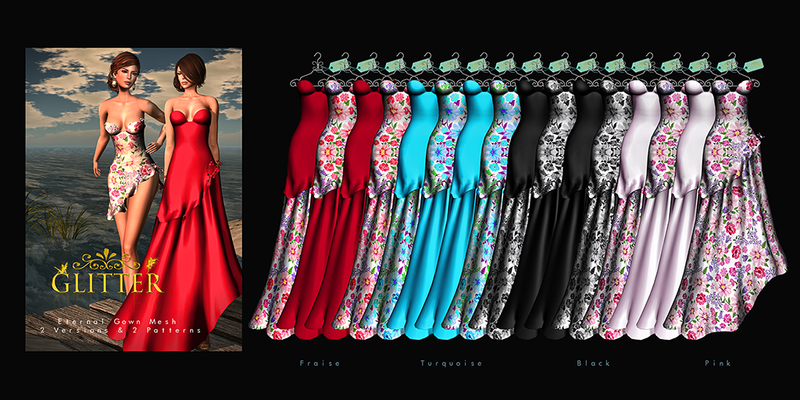 LURE is another exclusive fitmesh dress for Maitreya, Slink, Hourglass and standard sizes. Patterned in leather and opaque colored lace in 5 lovely tones. Also a reviewed version of Eternal mesh gown patterned with fishscale on the dress, which enhance with lights and shadows the total black looking and black lace for the skirt making of it a very feminine and versatil gown. You can find all these beauties at the Penumbra Retail shops till November, 6 aprox. This month GLITTER offers this “spooktacular” creation. Going out the usual rules of dark grey/black colors, I have wanted to show how bright tones of pumpkin, bordeaux and flash pink can give also a scary looking. Also included pink undies with Appliers for many body mesh like: Maitreya, Belleza, eBody and Omega. 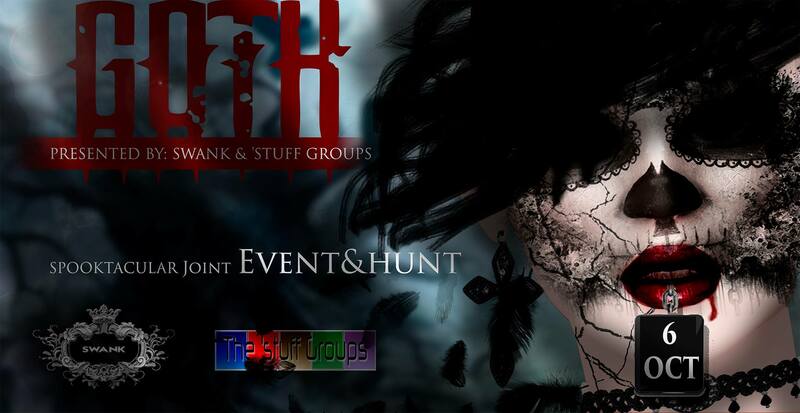 SWANK & ‘STUFF presents the Spooktacular Goth Event & Hunt Fashion / Beauty / Home and Garden !! A joint scare & sale from two of SL’s biggest themed events.SHOPPING , RIDES, HAUNTED HOUSE, PHOTO CONTEST & MORE. Teleporters to take you to both locations can be found scattered thru the event grounds. Look for hidden black roses for free gifts! This elegant gown is a must have in your wardrobe. Why? It is all about versatility. Not only does this sleeveless plunging neckline comes in 4 different colors , Fraise, Turquoise, Black and Pink but you can go from day to evening! This gown comes in 2 versions, short for the day or clubbing and long for that formal gala as well as solid, floral or mixed!!! 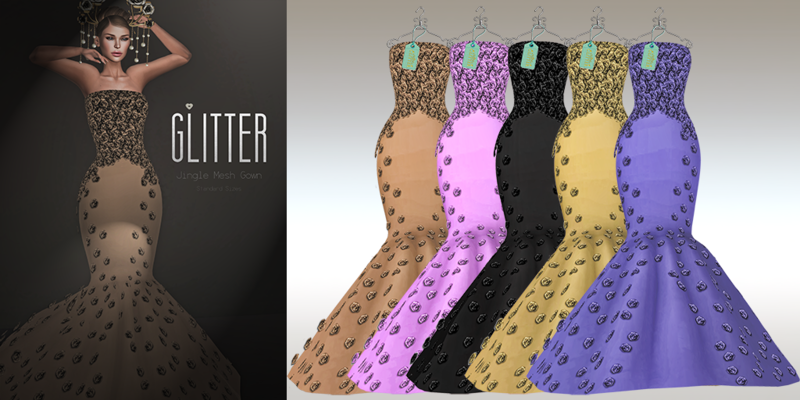 Which is tone of color you can change via texture hud if using this lovely flowers patter or solid color in short dress and ADD skirt as well, practically you get 4 dresses mixing in one ! !